This post is more about a concept than a “dish”. In fact, to call this a “side dish” feels wrong somehow. It is, however, something that shows up on our lunch-time table with alarming frequency and, therefore, probably deserves some mention. As the title indicates, it is pears (in this case sliced) dusted with peppercorns (in this case pink). That’s all; no fancy technique, no complicated spicing scheme. Just simple and tasty. So why write about it at all? Well, when you are facing a table full of highly spiced food, possibly hot, but not necessarily so, your taste buds will get to the point where they simply can’t cope any more. This was very much on my mind the other day after mowing my way through half of a bowl of Dan Dan Noodle. I really wanted to tie into the Mapo Tofu, but wasn’t entirely sure that I was still capable of tasting anything. Fortunately, this simple side dish was there to lend a hand and give me the break that I needed. 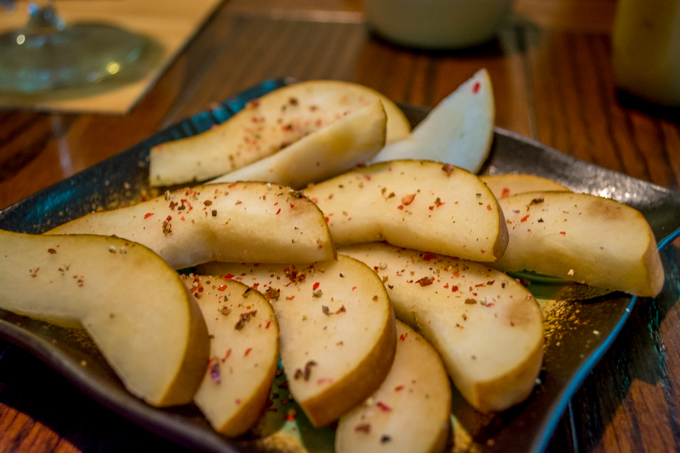 The crisp sweetness of the pears, accented by the peppercorn was just right for resetting my taste buds so that I could enjoy the rest of the meal. Now, I am not trying to present this as some kind of original concept. Those of you who go to wine tastings are probably quite familiar with the idea. Hint: the crackers are not there to fill you up. I did, however, want to bring the concept up in the context of spicy food, which you will see a lot of in these pages. Simple side dishes like this provide a flavor break and also encourage you to slow down and enjoy the dining experience. I think that the key to their success is making sure that you select something that is distinct in both texture and flavor from the foods you are trying to separate. In this case, using black peppercorns would not have worked as well because it would have been too similar to the Sichuan pepper used in both of the dishes. Next time you are serving a selection of highly flavored foods that have the potential to overwhelm your guest’s palate, give something like this a try. It is a tried and true method of making a meal more enjoyable. Drop a comment if you have any example sides that you use this way. Cheers.